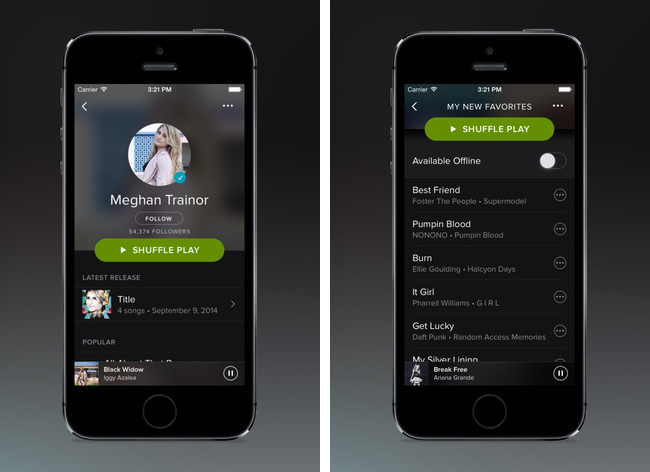 Spotify today released a new version of its iOS app [Direct Link] that adds Apple CarPlay integration. Spotify was among several iOS apps, including CBS Radio, iHeartRadio and Beats Music, that pledged support for the in-car iOS feature when it was unveiled earlier this year, and Spotify's update arrives just as Pioneer is rolling out CarPlay firmware support for several existing aftermarket systems. The updated music player will allow users to access their Spotify account using the car's in-dash receiver and a compatible iPhone. Other changes in version 1.8.0 include support for spoken Swedish and Québécois on iOS 8 and other various iOS 8 bug fixes. Apple's CarPlay technology brings iOS features such as navigation, messaging, music playback and more to car dashboards, making it easier for users to interact with those services while in the vehicle. Several automobile manufacturers, including Audi, Ferrari, Ford, Hyundai, and others, have partnered with Apple to bring the technology to their cars in upcoming model years. You know, because Apple has only sold more than 10 million phones. I'm waiting for spotify to support landscape mode. Is that too much to ask?! And I want iPhones 6/6+ support on most apps. Jeez... the Apple Store app just got updated yesterday... and the KNEW about the iPhone 6. Give these guys time. I'm thinking Spotify isn't concerned yet because the iPhone 6 hasn't hit critical mass for them yet.